Positioned on the city’s civic spine on the corner of Swanston and Victoria Streets in Carlton, developer Hengyi’s new 70-storey residential tower Swanston Central is set to become an iconic Melbourne building. A planning permit has been granted for the 70-level, Elenberg Fraser-designed tower, which will feature a multi-coloured facade that will change colour at different times of day. The tower will be made up of 1,039 one, two and three bedroom apartments, with 216 car parks, parking spaces for 350 bicycles and ground floor and mezzanine retail space – including premium retail and food and beverage fronting Bouverie Street. Lap Pool[/caption]Premium residential facilities will include a 25 metre pool, hot and cold spas, plunge pool, individual sauna and steam rooms, cabanas, a winter-garden, library boardroom, cinemas, games rooms, grand dining room, grand lounge bar and sky bar and lounge. Tim Storey, Colliers International Managing Director of Residential, said that unlike many highrise developments, Swanston Central was mainly being marketed to domestic buyers. 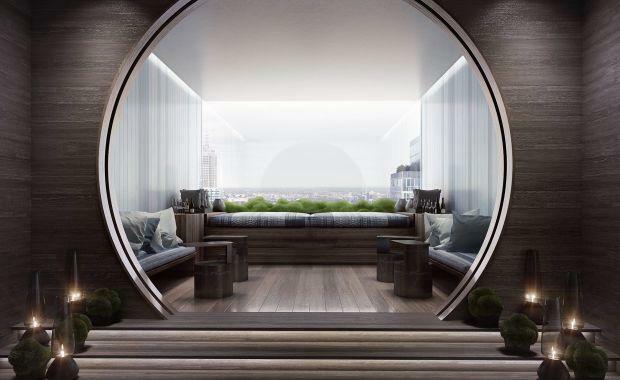 “With only limited marketing into China, and Asia more broadly, we will be concentrating on selling these stunning apartments primarily to the Australian market,” Mr Storey said. Common Dining Room[/caption]“This will be an iconic, high quality residential tower in an outstanding location, and we expect it to attract strong interest from the outset. "Mr Storey said Swanston Central offered a prime location at the northern edge of Melbourne’s CBD, close to entertainment, transport, retail and education. “Carlton is one of the most dynamic and diverse suburbs in Melbourne, where entertainment, cultural and leisure activities can be found side-by-side with educational, business, retail and residential facilities,” Mr Storey said.